This semi-pro deep fryer automatically filters and stores oil for you! 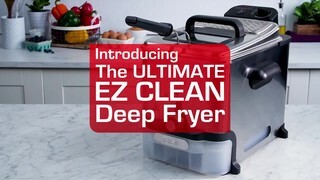 T-fal Ultimate EZ Clean Deep Fryer features a unique oil filtration system that automatically drains, filters and stores oil for future use. It also has an advanced oil temperature heating system, which creates the ideal temperature to seal food’s exterior and prevent excessive oil absorption. With a powerful,1700-watt heating element, temperature remains stable. The result? Healthier, crispier meals!